For her Dissertation, Xochitl is conducting a project on conservation genetics of the Critically Endangered Kemp’s Ridley sea turtle in Tamaulipas and Texas. 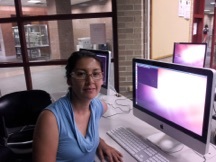 She is also characterizing genetic variability of the channel catfish in Tamaulipas and Texas. She has a CONACYT scholarship from Mexico. Recipient of a Fulbright fellowship. Fellow of the Louis Stokes Alliance for Minority (LSAMP) Bridge to Doctorate (BTD) Fellowship program at TAMU. For her Thesis, Danielle conducted research on population genetics of the blue crab Callinectes sapidus in the Gulf of Mexico and the Atlantic coast of the USA. Dissertation: Evolution of Ligia isopods in three geologically dynamic regions. Thesis: Phylogeographic patterns of the intertidal isopods Excirolana braziliensis and Excirolana mayana (Isopoda: Cirolanidae). Thesis: Phylogeographic patterns of Tylos (Isopoda: Oniscidea) in the Pacific region between southern California and central Mexico, and mitochondrial phylogeny of the genus. Thesis: Regional and local-scale population genetic structure of a primitive teleost, the African Bonytongue (Heterotis niloticus), in rivers of West Africa.